Rest: Oh if I could but teach this one important principle – one of the most important things you can do after you’ve an injured an area is REST IT!!! I can’t tell you how many times people come in to me and say something like “I thought I could play through it,” “I thought I could run it off,” or “I thought it would get better if I just kept going.” There’s a reason why major league pitchers take 4 days between starts. There’s a reason why most football games are only played once/week. There’s a reason why it’s recommended not aggressively exercise the same body area two days in a row. The bottom line is your body needs time to heal and recover. If you have an injury there’s no shame in taking a couple of days off while your body addresses these areas. Remember, in the long run it’s only a couple of days. Ice: Cryotherapy (there’s a new, big, smart word for you!) is vital to decreasing swelling, pain, and the inflammatory response. Cold does a number of things – it causes vasoconstriction (your blood vessels and capillaries constrict to get smaller) thereby reducing swelling in an area. With this vasoconstriction you also limit the amount of inflammatory agents (neutrophils, macrophages, histamine, etc) to an area which ultimately results in a more-appropriate healing response. Finally, cold decreases nerve conduction velocity – the pain signal doesn’t get up to your brain as strongly and you perceive less pain. For effective cryotherapy you can use anything from ice cubes and frozen peas to gel packs and cooler/sleeve combos. Compression: Compression is a vital yet often-overlooked piece of the equation when talking about injury rehab. Compression decreases the volume of fluid that can get into an area and is therefore the best thing you can do to limit swelling. It also serves to support an injured area by “bracing” it (that whole rest thing we talked about in point one above). Compression can be achieved using anything from simple ACE wraps and Coban to braces and compression garments. Elevation: Keeping an injury elevated will serve to keep down swelling via gravity. 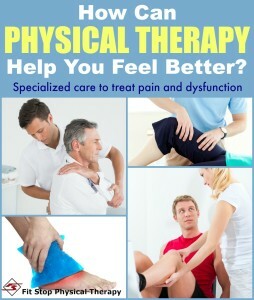 This is most evident in ankle, knee, and wrist injuries. These areas are often in a “gravity-dependent” position where gravity will take all the swelling and extra fluid and blow it up like a balloon. Keeping it elevated restricts the amount of fluid that will flow into an area as the fluid has a harder time going against gravity. One note – oftentimes patients think “elevating” an injury means kicking your foot up on an ottoman, the computer tower under the desk at work, or sitting in a recliner. In reality elevation is only effective if it’s above the level of your heart! This means laying on the floor with your foot on the couch, laying on your couch with your foot up on the back of the couch, or keeping your arm raised over your head like you have a question to ask in school. These positions give the fluid somewhere to go – back in to your body as opposed to pooling somewhere in the extremity you’re trying to elevate. 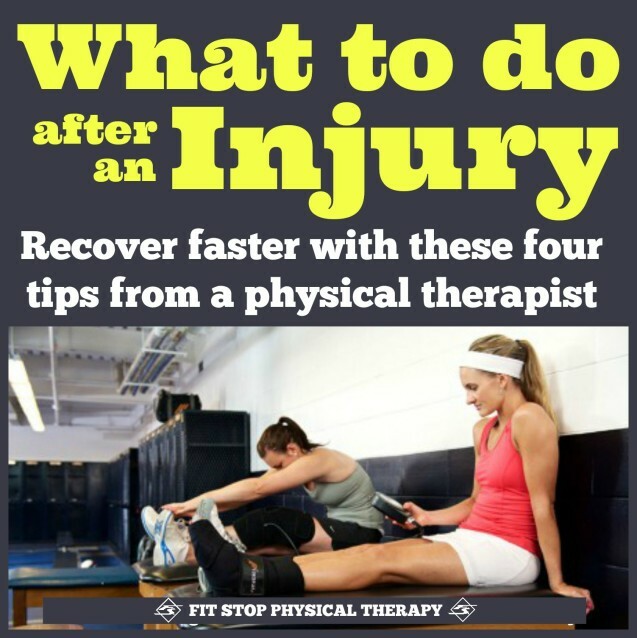 Taking the proper steps after an injury is essential to decreasing recovery times and getting you back in the game faster. 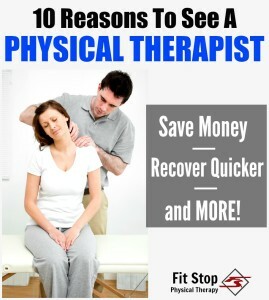 At Fit Stop Physical Therapy our therapists are extensively trained in injury recovery – everything from turf toe and ankle sprains to knee injuries and shoulder strains – let us help you get back to what you enjoy doing! To set up a physical therapy consultation with one of our trained professionals nearest you please visit our “Contact Us” page at this link. 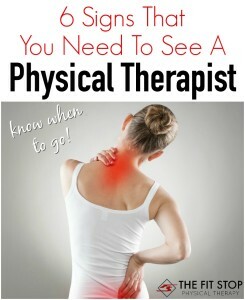 But how do I know if my injury needs physical therapy? How long after an injury should I wait until I call my doctor? We’ve got the answers for you right here (click the picture below to be taken to the article). I recently underwent shoulder surgery and am in the recovery stages. It was a rather minor surgery so I’m not entirely sure what form of physical therapy or rehabilitation I should look into. Whenever you get injured in any way, you can never go wrong with heat and ice. It may not cure the injury itself, but it can definitely reduce swelling. Shoulder surgery is a painful experience… regardless of how “minor” it may have been. Sounds like you’re taking the right steps with heat and ice in promoting healing and decreasing inflammation. Wishing you a speedy and complete recovery, Carter!